Andrea Dovizioso has made some strong steps with Ducati, fighting for the victory at Qatar and gunning for a top five championship position, the Italian is going slow and steady aboard the GP15. 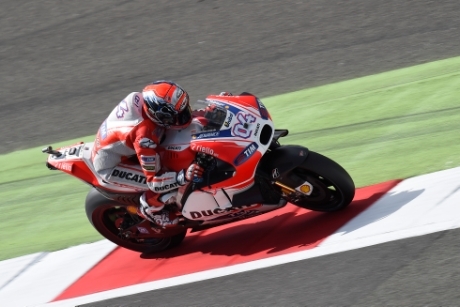 Coming into one of his favourite circuits of Silverstone with a positive attitude, Dovizioso hopes for a good weekend. With a track that suits the character of his bike as well as his own riding style. British glory has found him before back in 2009 at Donington Park, and narrowly missing out on a podium here last year he needs a good result to get his season back on track. Despite a good start the 29 year old has only managed a top six finish since his last podium at Le Mans back in May. “Our start was amazing, in the pre-season we set the fastest time the second test, and at Qatar we set the pole position and fought for the victory in the last corner. So we had a really good start, especially with the new bike.